Invented and patented by a tinsmith named John Landis Mason in 1858, the Mason jar has long been an integral part of home canning. Beyond preserves, the molded glass, often embossed with the name of the manufacturer, and sometimes tinted in blue, purple, or green, are handsome little containers indeed. In the world of DIY, Mason jars are like a blank canvas waiting to be adorned. Since Christmas is just around the corner, we’ve scoured the web and rounded up the very best Mason jar crafts for the holiday season. You can always give these as gifts, but they are so wonderful you might just keep them for yourself! If you don’t have any spare mason jars to hand, you can simply order some from this page on Amazon. 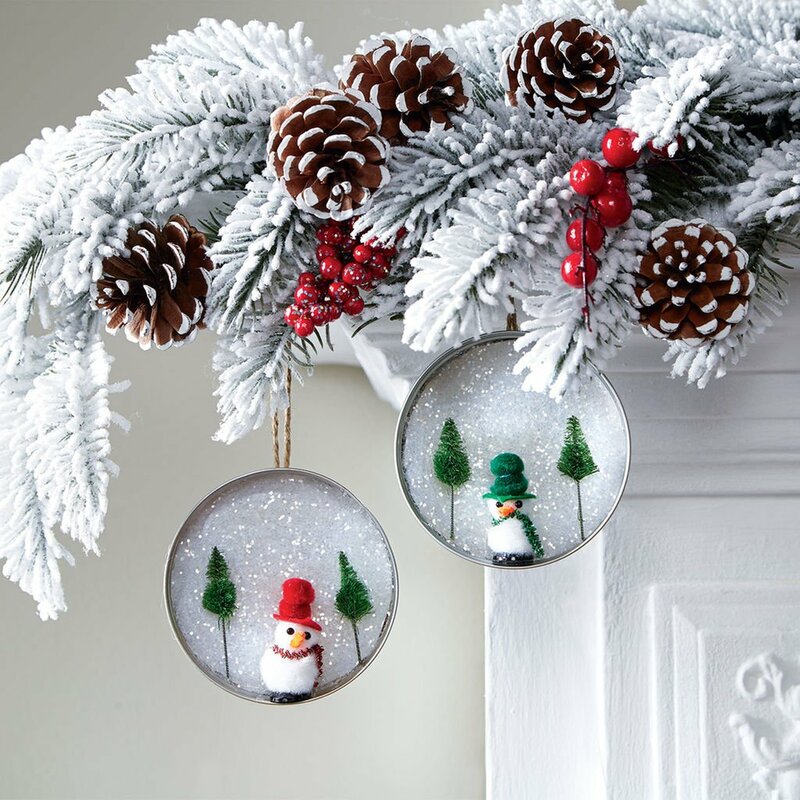 Modelled after snow globes sold by Anthropologie, this DIY is easy-peasy. 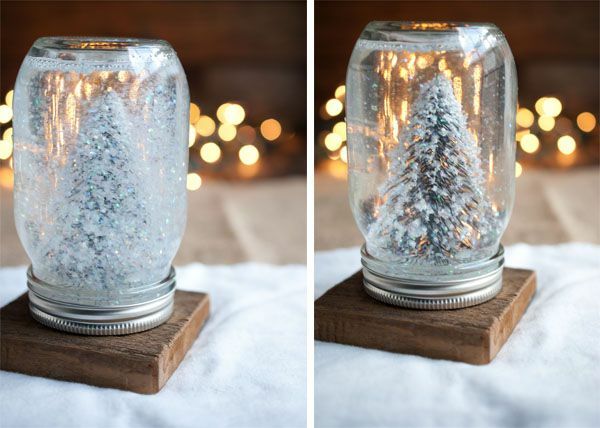 All you need is a Mason jar, white glitter, waterproof glue, and a snowy tree in miniature – though this project can be customized with any Christmas-y object that can fit comfortably into the jar. Add water and shake! Create some festive ambiance with frosty hanging lanterns. Using Mod Podge, paint your Mason jar and roll in a bowl of Epsom salts to concoct the ice-kissed look. 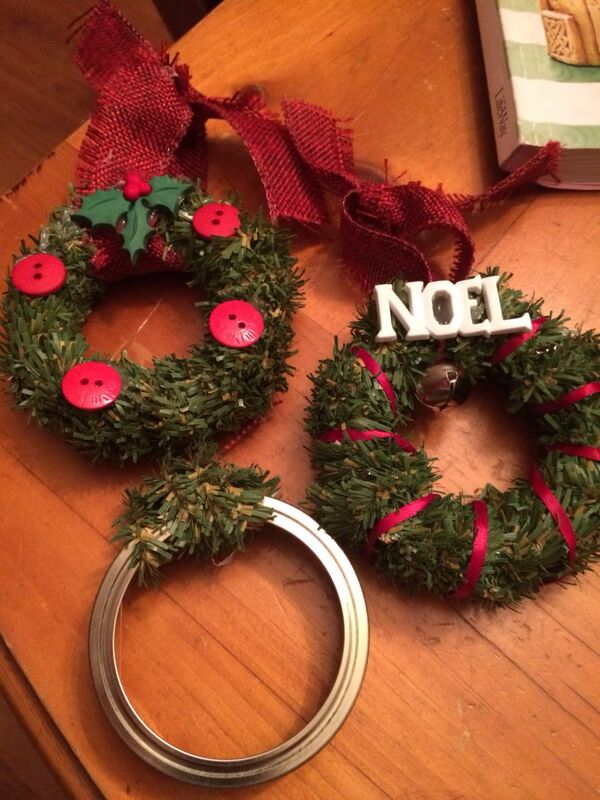 Hot glue little flourishes around the rim, like a sprig of evergreens and winter berries, and tie with a cute bow. Drop in a tealight to enjoy the soft glow. Beautiful indoors and out, a collection of Mason jars are stuffed with white string lights to create a wall-mounted chandelier of sorts. Tied together and arranged with a mix of grapevine wire and burlap ribbon, you can replicate this rustic look or choose your own embellishments to show off your Christmas spirit. Just because it’s snowing outside doesn’t mean we can long for more temperate climes! 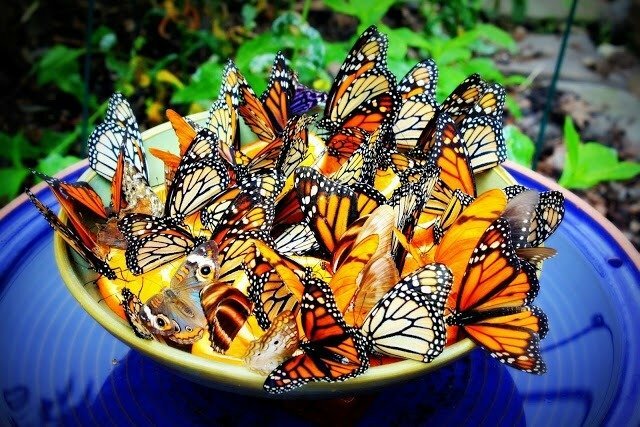 Create a little lush world all your own in the space of a humble Mason jar. Choose a theme – a serene forest for example – and decorate with moss, pine cones, twigs, acorns, and miniatures like mushrooms, birds, and woodland animals. Pop a frog lid insert on top of your Mason jar and it becomes a lovely flower vase. Simply fill with your favorite festive flowers like poinsettias and you have yourself a stunning centerpiece. So many Mason jar crafts use only the glass bottoms, but here’s a project that’s all about the lids. Use the toppers to create hanging tree ornaments by hot-gluing white glitter for a backdrop that sets the scene for snowmen and evergreens. This is a great craft you can get the kids involved with. A simple setting for the center of your Christmas table, all you need for this project is four Mason jars in different sizes, floating candles, fresh cranberries, ribbon, and some evergreen sprigs. Nothing beats the simplicity of twinkling candles and the smell of freshly cut evergreen sprigs during the festive season! Paint these beautiful snowy scene silhouettes on blue Mason jars and let your lighting tell a magical Christmas story. Immerse yourself in little miniature town scenes, let your creativity come to life and enjoy the cozy winter evenings. A novel way to display your favorite family photos, simply plunk a black and white picture into a Mason jar and fill with vegetable oil. The yellow hue of the oil gives the photo the vintage sepia tone look. A unique take on Mason jar candles, this craft involves forming a candle using a large Mason jar as a mold. You will have to sacrifice the jar in order to do it (and here’s how to cut glass without special tools) but the results are so totally worth it. Another craft that utilizes only the lids, simply spray paint the toppers in alternating white and red, string it all together using twine, and hang on a door or wall. This is a great alternative to wreaths using fresh twigs and evergreens as you can use it year after year. Durable, long lasting and unique, this will certainly be our list of crafts to make this holiday! The holidays proffer up the perfect excuse to indulge your sweet tooth! Instead of putting out a candy dish, dress up a trio of Mason jars as Santa Claus, a Christmas elf, and a snowman. Once you’re finished decorating the jar, fill up each with the requisite color of Hershey’s Kisses. They make perfect teacher gifts too! A fun activity to do with the kids, Mason jars are painted white and garnished with googly eyes, buttons, pom poms, pieces of fabric, colorful sting, Christmas socks, and any other crafty materials you may have laying around. Finish by adding a tealight to make your little snowman shine. Beautiful any time of year, give your Mason jars a faux stained glass treatment with Gallery Glass paints, peel and stick lead lining, and liquid leading. Once finished, use it for candles, as a vase, or just as an all-purpose holder of things. There are so many ways you can dress up a Mason jar oil lamp! Poinsettias, pine needles, pebbles, clementines, and berries are all terrific Christmas themes to run with. Add some festive essential oils to the mix – a blend of cinnamon, spruce, and orange would truly capture the scents of the season. Because even the soap dispenser should get the Christmas treatment! This simple craft would make a prefect gift, and can even be used to house some festive chocolates. Conjure up the unmistakable smells of Christmas with this gorgeous and fragrant Mason jar of potpourri. Using the Mason jar lid band, wrap green pipe cleaners around the ring. Decorative touches like red ribbon, buttons, and bells can be added to complete the look. That’s right, a Mason jar Christmas tree! Definitely a minimalist design, the nice thing about this setup is it can be reused year after year. Recreate the classic scene of hauling a Christmas tree on the roof of a car – in a Mason jar. Step it up a notch and decorate the tree with mini string lights.